High quality 2x phono to 2x phono leads. Metal body connectors with Gold Plated contacts. OFC cable with colour coded connectors. Don't be fooled by the low price on this high quality cable. 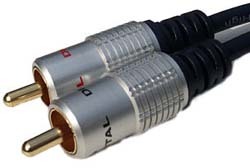 A stereo audio cable with 2 phono / RCA connectors on each end. The cable features oxygen free copper interconnect, metal bodied phono plugs with gold plated contacts. Profigold PGC5609 High Performance Digital Satellite Coax Cable on Reel 100m. 99.996% Oxygen Free Copper conductor Triple (double braided + foil) shielding High Quality AFPE insulation White UV and temperature resistant outer cable jacket Diam 7.0mm Greater than 110dB Meter marking. Profigold by Bandridge PGV332 1.5m Component Video Lead, 3RCA - 3RCA. 24k Gold Plated contacts ensures optimum signal transfer. 99.96% OFC conductor for high resolution picture quality. IAT interference absorbers for unmatched picture performance. Home Entertainment Magazine 4 Star Award June 2000. Lifetime replacement warranty against design, construction, material & manufacturing defects Perfect for video connections between DVD & Projector, LCD, Plasma, TV etc. 5m toslink to 3.5mm mini toslink optical cable. High performance optical signal transfer for digital audio. Totally immune from noise interference. Pearl chrome metal plugs. Perfect for toslink connections between portable audio players and amps etc.